Drawing on the specifications that have made the Les Paul the most legendary electric guitar of all time, the Les Paul Classic Antique Guitar continues Gibson’s popular Classic line with the vintage touches guitarists love. All the affordability and performance of the Les Paul Classic with a gorgeous Fireburst finish. With a beautiful, figured maple top and acclaimed ’57 Classic “Patent Applied For” humbuckers. Classic, vintage Les Paul tone and performance with a breathtaking new look. The Les Paul Classic Antique allows players to experience the power and performance of an original Les Paul at an affordable price. One of the enduring images of 1969’s Woodstock Festival is of Alvin Lee blasting out the solo section of “Going Home” on his 1959 ES-335 (which Lee nicknamed Big Red). When he cranked out the scorching solo to “Going Home” at Woodstock, his iconic axe became preserved for all time on celluloid. The Custom Shop has lovingly recreated Big Red, including the stickers and artwork found on the body of the original, the added third pickup, custom pickguard, and the replacement ‘60s block inlay neck. The Gibson Custom Shop Alvin Lee Big Red ES-335 Guitar is here in the flesh, reproduced with utmost precision right down to the cool stickers and faded cherry finish. With its solid maple center block, arched top, f-holes, and chambered wings, the Gibson 1959 ES-335 Dot Reissue Guitar gave the player the resonance of a solidbody and the refined looks of a traditional Gibson archtop with the reduced weight of a thinline. In mid-1962, the ES-335 was changed to include the thinner neck profile that was standard for Gibson in the ‘60s as well as small block inlays on the fingerboard. The Gibson Custom Shop 1959 ES-335 Dot Reissue Guitar follows the vintage specs of the ’59 model with its rounded neck and dot markers that would change to a thinner profile and block inlays in 1962. With its beautiful tone and versatility the ES-335 still remain the classic favorite of guitarists across all music genres. still one of the all-time classic guitar designs! The Custom Shop offers a plain top and satin lacquer finish that make the all-time classic Gibson Custom Shop ES-335 Satin Finish Guitar more available to dedicated players like you. The ES-335 brought hollowbody tradition and solidbody performance together in 1958, and it is still one of the all-time classic guitar designs. ’57 Classic humbuckers translate the body’s natural resonance into haunting jazz tones or searing distorted leads. 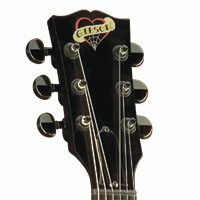 60s slim taper neck profile is very fast and comfortable while bound top and back, vintage tulip tuners, nickel hardware, and pearloid dot inlays add up to fantastic visual appeal. The precision Gibson Custom Shop 1963 ES-335 Historic Block Reissue Electric Guitar is identical in every way to the original. 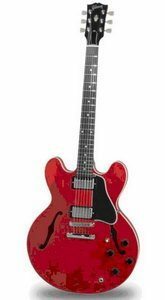 With its solid maple center block, arched top, f-holes, and chambered wings, the ES-335 (introduced in 1958) gave the player the resonance of a solidbody and the refined looks of a traditional Gibson archtop with the reduced weight of a thinline. 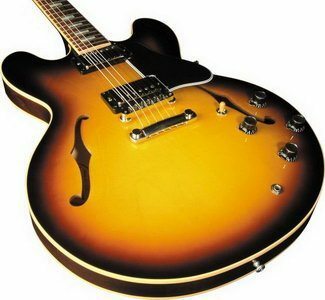 In mid-1962, the ES-335 was changed to include the thinner neck profile that was standard for Gibson in the ‘60s as well as small block inlays on the fingerboard. cooler than a Royal Flush and hotter than a showgirl. 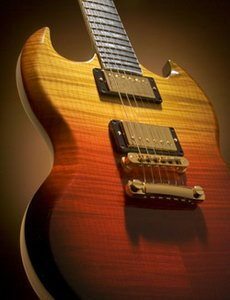 The SG Supreme sports the flame maple top that for decades has distinguishes the most valuable and desirable Gibson Les Paul musical instruments. Rich translucent finishes enhance the figuration of the wood grain, giving the SG Supreme an unique and memorable look. The Gibson SG Supreme Electric Guitar with ’57 Humbuckers has 24 easy-to-reach frets. A flamed maple top with stunning burst finishes and a bound ebony fretboard featuring split-diamond inlays result in one of the sweetest-looking SGs ever. Stadium-ready tone comes from the amazing ’57 humbuckers that dictated a whole generation of rock ‘n’ roll sound. Alnico II magnets, vintage enamel-coated wire, nickel-plated pole pieces, nickel slugs, maple spacers, and 2-conductor braided wiring make these true vintage heavyweights that dish out creamy clean tones, screaming sustain, and gravelly crunch. Gibson’s classic wood combination of maple-on-mahogany body with a mahogany set neck adds resonance and sustain. 1959 slim-taper neck furnishes a fast feel. Includes Gibson hardshell case. Don’t miss your chance to own one of the coolest guitars ever, with a killer figured maple top. why not play a true legend? The new solidbody guitar of the ’60s, the Gibson SG guitar, broke through traditional concepts of solid body electric guitars and became an instant classic. The SG body style has remained in production since its first appearance in 1961. The classic double cutaway look has been around almost as long as Rock and Roll. Always a best seller, the Gibson SG Standard guitar has all the classic features you’d expect from a historic guitar: it takes the best of the ’62 original and adds the longer and sturdier neck joint of the late ’60s musical instruments; the dual humbucking configuration and body style that continues to drive this bad boy onto stages and studios everywhere; hot humbuckers go from rich, sweet lightning to warm, tingling waves of sustain; a silky-fast rosewood fretboard plays like a dream; the original-style beveled mahogany body looks like a million bucks. 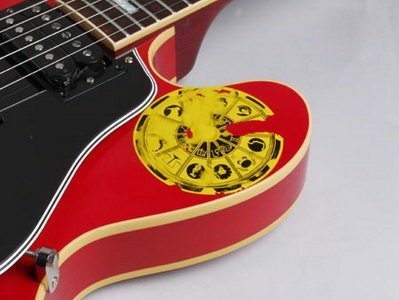 Plus, there’s a tune-o-matic bridge and chrome hardware. Limited lifetime warranty. Includes hardshell case. Why not play a true legend, the one of the most popular incarnations of the legendary Gibson SG guitar? Light weight, incredible playability, and the tone that launched a billion riffs. all the glitz of the New Century series. The new solidbody guitar of the ’60s, the Gibson SG guitar, broke through traditional concepts of solidbody electrics and became an instant classic. This body style has remained in production since its first appearance in 1961. The classic double cutaway look has been around almost as long as Rock and Roll, it takes your performance to the next level. All the glitz of the New Century series with a light-weight Gibson SG special body for total playing comfort and pure rock and roll style. For the heaviest headbangers. All the blistering power of the Menace series with a pure metal SG body design. Available in Flat Black only. The new solidbody guitar of the ’60s, the Gibson SG guitar, broke through traditional concepts of solid body electric guitars and became an instant classic. This body style has remained in production and has been screaming since its first appearance in 1961. These musical instruments have represented the combination of looks, functionality and value that is the hallmark of the SG series. 1961 was the year that Gibson changed the Les Paul Custom body style into a sharply pointed double-cutaway. This radical new design featured a thinner, bolder shape and was given the name SG for solid guitar.